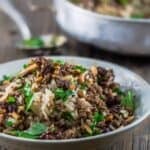 If you thought rice is a benign, boring side dish, this Hashweh Lebanese Rice will change your mind! Adorned with meat, toasted nuts and raisins. And loaded with flavors from aromatics and warm Middle Eastern Spices. Hashweh makes a glorious holiday side dish, but it can be the star dish any day of the week. See serving suggestions, and be sure to view the video tutorial for how to make hashweh. 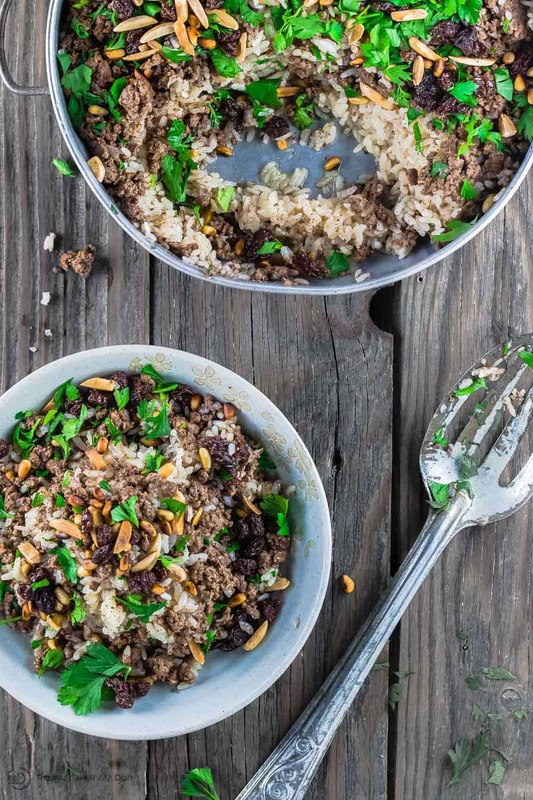 In our household, this Lebanese rice has been lovingly named, “dirty rice.” It is more properly known throughout the Middle East as hashweh, which literally means stuffing or stuffed. 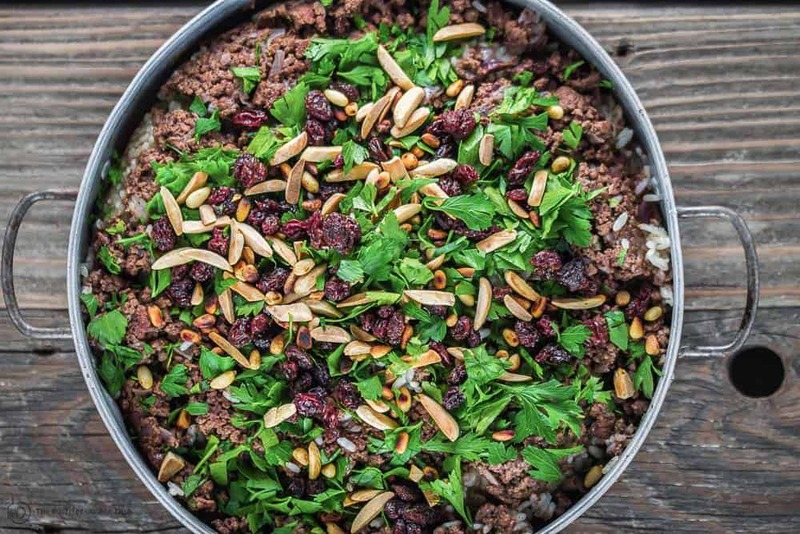 Hashweh is a one-pot rice dish, loaded with ground or minced beef (or lamb), lots of toasted nuts and dried fruit like raisins. It is anything but bland. Expect layers of flavor in each bite, thanks to aromatics and warm Middle Eastern spices like cinnamon and allspice. But it can easily be the main star on any given night, don’t you agree? 2- The cooking process for hashweh begin with browning the meat (you can use ground beef or lamb), along with aromatics and warm spices. We are layering flavors from the very start! 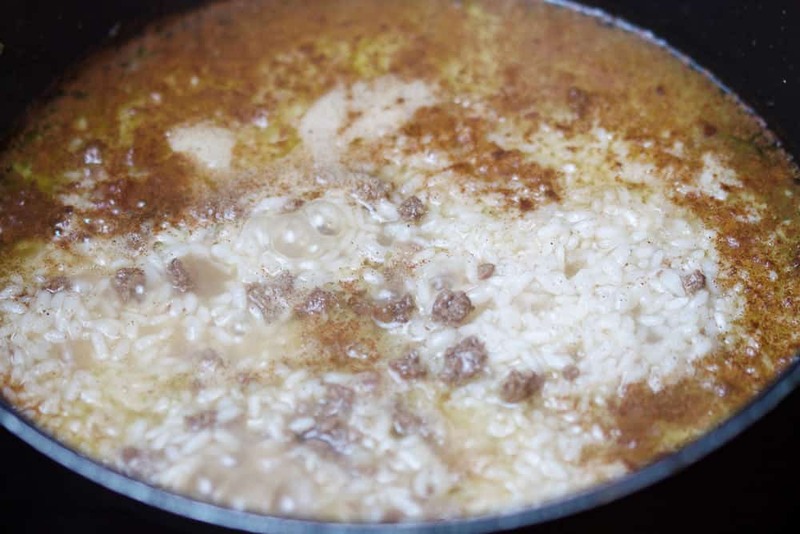 3- Once the meat is fully cooked, we add our drained rice right on top (all in one pot). We also make sure to add a little more of the same spices to carry the flavors through. Water and a drizzle of extra virgin olive oil are the last couple ingredients to add. Bring to a boil until the water reduces by a lot. Then cover and cook. 4- Important tip, once the hashweh rice is fully cooked through, the best thing you can do to it is to leave it covered and undisturbed for a few minutes before uncovering it. This is important for texture and flavor. 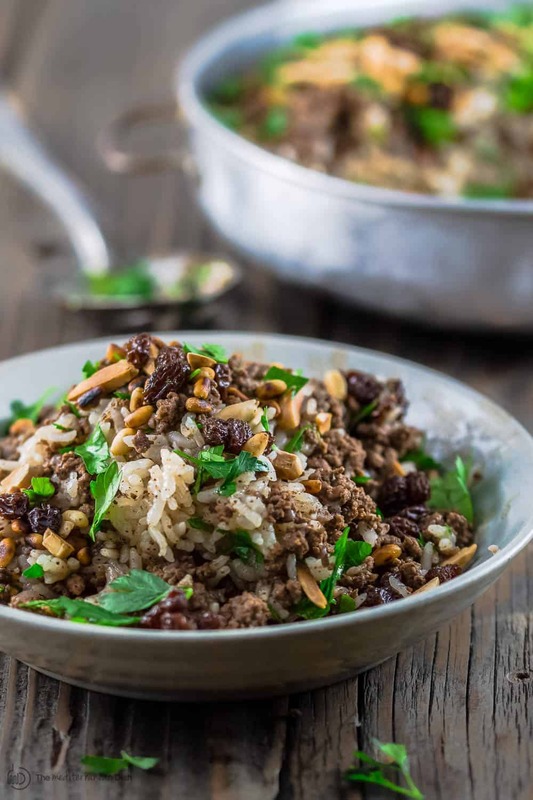 5- To serve the hashweh rice, simply turn it onto a plate (watch my video below to see how I do it), then add all the beautifully toasted nuts and raisins, maybe a little parsley for garnish. Glorious! 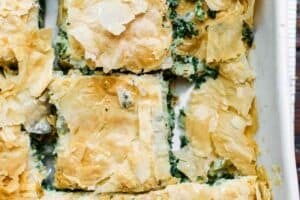 What to serve with Hashweh Lebanese Rice? Sure, this gorgeous Lebanese rice makes a great side dish. And I do often serve it as a gluten-free stuffing alternative for Thanksgiving! But, I have no shame serving it as a main course with a couple of yummy sides. I like to turn hashweh Lebanese rice into dinner bowls with a side salad like this chickpea salad or fattoush and a little creamy roasted garlic hummus! The kind of dinner bowl equal in awesomeness to these Greek Keftedes dinner bowls or this Lebanese Fatteh! Soak the rice in cold water for 15 minutes or until you are easily able to break one grain of rice between your thumb and index fingers. When ready, drain well. Meanwhile, heat 1 tbsp of olive oil in a heavy cooking pot. 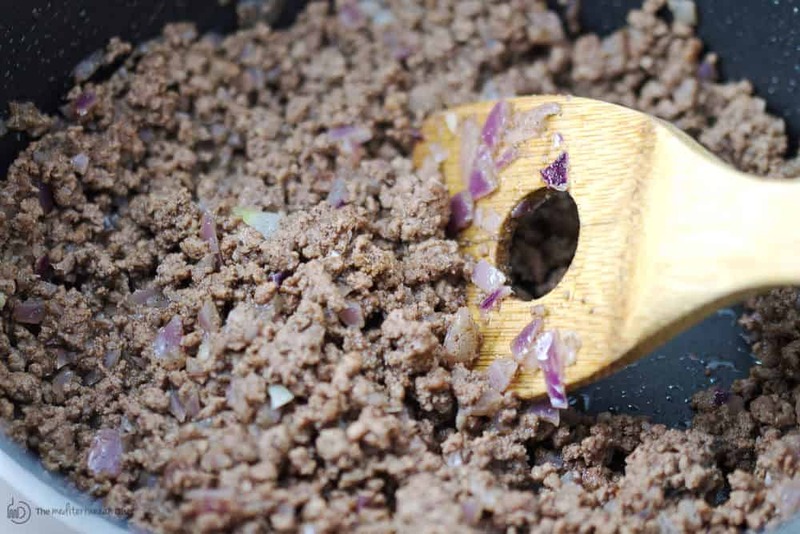 Add chopped red onions, cook on medium-high heat briefly, then add the ground beef. Season the meat mixture with 1 1/4 tsp allspice, minced garlic, 1/2 tsp ground cloves, 1/2 tsp ground cinnamon, salt and pepper. Toss together to combine. Cook until the meat is fully browned (8-10 minutes). Drain. Top the meat with rice. Season the rice with a little salt and the remainder of the allspice, ground cloves and cinnamon. Add 2 1/2 cups of water and 1 tbsp of olive oil to cover the rice. Turn heat to high and bring the liquid to a rolling boil. Let boil until the liquid has significantly reduced (see picture below). Now turn heat to low and cover; let cook for 20 minutes or until moisture has completely been absorbed and the rice is no longer hard nor sticky. Remove from heat and set aside for 10 minutes. Uncover the rice pot and place a large round serving platter on the opening of the rice pot. Carefully flip the pot contents onto the platter so that the meat layer now tops the rice. Garnish with parsley, toasted pine nuts, almonds and raisins. Enjoy. Pro Tips: Be sure to watch the video tutorial above this recipe. A couple of important of tips to remember: 1) before you do anything, make sure to rinse the rice well and let it soak for a few minutes.This will ensure the rice is not sticky and that it will cook quickly and evenly. 2) When the hashweh is ready, leave it covered and undisturbed for a few minutes before serving. Again, this ensures texture but also flavor. SAVE! 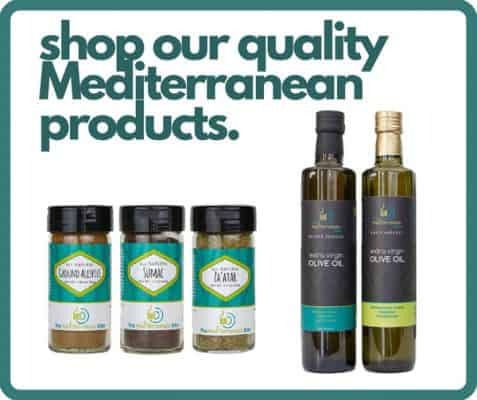 Try our Ultimate Mediterranean Spice Bundle, or create your own 6-pack or 3-pack of fresh, all-natural and organic spices! *This post was originally published in 2014 and has been updated for readers benefit. 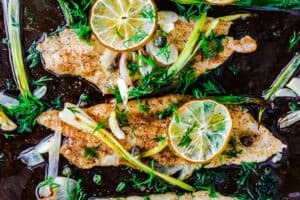 We love this recipe so much! We’ve made it so many times. We were craving this the other day, but we’d run out of rice. Instead, I grabbed some leftover pie crust from the fridge and made an impromptu pot pie, garnished with parsley and slivered almonds! In case anyone’s wondering, it makes a fantastic savory pie. Our stomachs thank you! Oh wow! that is so clever! Thanks for sharing, Kristen. Glad you enjoyed it! what kind of medium grain rice did you use? i dont know any except arborio which is usually made for risotto? long grain rice also works here, if that’s easier! I also can’t see the video. Tried an ipad and also a Mac. Hi George, please be sure to try the google chrome browser or a different browser than safari or be sure to “unblock” videos and ads via your browser as that is what is preventing you from seeing the video. Thanks so much for sharing, Margaret! 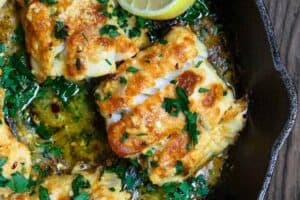 Would I be able to use brown rice for this dish using the same cooking instructions? Thanks! Hi Dori, brown rice cooks differently…it requires more water and longer time to cook. I’d follow the rice package instructions for cooking the rice, but you can certainly adapt the recipe and use the rest of the ingredients. I made this dish for Christmas Day dinner (for 10). What an amazing rice dish … so full of flavour and warmth … everyone enjoyed it. Thank you so much. Love this dish. I turned this dish into vegan. i used soya mince loved it. Thanks for the amazing video tutorial. if you scroll down toward the bottom, the video appears just before the recipe where it says “watch the video for how to…” If you don’t see it on mobile, try your desktop. it may be blocked by your own browser, however. I thought this was delicious and relatively easy. Mine came out dry though and stuck to the pan. Perhaps I overcooked it? Knowing how powerful my burners are, I cut 5 minutes off the 20 minutes. And it still stuck. I had my heat down really low too. It was still good, but my shape on the plate wasn’t quite as good as yours! Oh, and I used ground lamb as that was all I had. I thought the lamb really added to the flavor of the dish and I will do that when I make it again. And I will!! Thank you! Thanks for sharing, Alene! Sounds like your burners are quite powerful, so yes, something to watch for as cooking time may vary. I love that you used ground lamb, I do too sometimes. It’s great! can you use basmati rice? Basmati rice cooks differently. If possible, find long grain rice. if found, might you please send the link? The video appears right above the recipe. This may be an issue with your browser, particularly if you are viewing this on your phone where somehow videos may be disabled. Delicious, made it this afternoon. Look forward to making it again as my local store had neither garlic powder nor fresh parsley. I got by but can’t wait to taste it as it’s intended. Super easy to make by the way. The rice was perfect. Awesome, Heather! So glad you tried it! First made this recipe for Syrian refugee friends and made the same thing for my family as it smelled so tantalising while it was cooking. I made it again tonight with Bison grd meat and served it with braised Bok Choy with a dressing of Rice wine vinegar, red chilli, fish sauce and cilantro. A delicious combo! I love the aromaticness of the Hashweh! Amazing and so simple. JRC, thank you so much for sharing! Glad your family and friends enjoyed it! 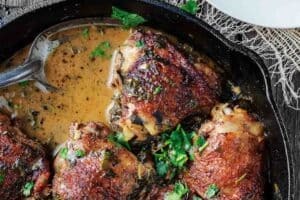 I initially made this dish with lamb and it was amazing! It’s one of my favorite things to make, as well as the lebanese rice and the za’atar salmon. 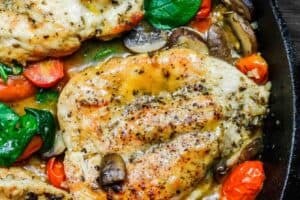 Would this dish be well suited for freezing? I’d like to take it camping with me, so it’d be re-heated over a skillet. I’m going to try it out, but I’d like the author’s opinion. Thank you for sending these recipes ! The beef ,rice and nuts was a dish I had forgotten about..my dear Lebanese neighbor thought me that recipe many years ago. Wonderful, Lynn! Glad to hear it! This was delicious! I will add even more of the spices next time. Wonderful, Ann! Thanks for sharing! I made this a few days ago. I didn’t follow the directions and used some very long cooking rice along with the white rice and it still turned out great! I can see if I would have used all of one type of rice it would have had the right consistency for the rice. Flavors were very good. Sue, thanks so much for giving it a try. This is one of my favorites.